Length: 7 hrs. 9 min. New York Times best-selling author of Wild at Heart John Eldredge offers readers a step-by-step guide to effective Christian prayer. How would it feel to enter into prayer with confidence and assurance—certain that God heard you and that your prayers would make a difference? It would likely feel amazing and unfamiliar. That’s because often our prayers seem to be met with silence or don’t appear to change anything. Either response can lead to disappointment or even despair in the face of our ongoing battles and unmet longings—especially when we don’t know if we’re doing something wrong or if some prayers just don’t work. 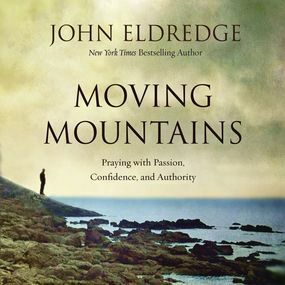 New York Times bestselling author John Eldredge confronts these issues directly in Moving Mountains by offering a hopeful approach to prayer that is effective, relational, and rarely experienced by most Christians. In a world filled with danger, adventure, and wonder, we have at our disposal prayers that can transform the events and issues that matter most to us and to God. Moving Mountains shows you how to experience the power of daily prayer, learn the major types of prayers—including those of intervention, consecration, warfare, and healing—and to discover the intimacy of the cry of the heart prayer, listening prayer, and praying Scripture. Things can be different, and you personally have a role to play with God in bringing about that change through prayer. It may sound too good to be true, but this is your invitation to engage in the kind of prayers that can move God's heart as well as the mountains before you. Moving Mountains is also available in Spanish, Mueve montañas. To dive deeper into the Moving Mountains message, the Moving Mountains study guide and video study are available now.